Garage door cables come in all different sizes and levels of thickness. The size and thickness of the cable depends on the size and weight of the garage door it is installed with. Every garage door has a specific cable size that will work best. You can see the difference in cable size below. In the picture you see, the thinner, smaller cable snapped because it wasn’t the right size for the door. The cable of the left is new, and the proper size for the door. You can see the difference, and it’s easy to understand why the smaller, thinner cable failed. You can also see the spot on the broken cable where it snapped. This is the most common place a garage door breaks. We perform many repair jobs for customers due to garage door cables that break or snap. 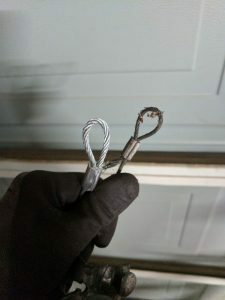 Cables reduce the tension of the garage door’s springs. The right size cable helps to support the springs, and can also give more life to your springs. The cables also help your garage door open more smoothly. We see a lot more spring repairs than cable repairs. Usually, the spring is more fragile, so when it breaks, the cable acts as a pack up to ensure your garage door doesn’t fall down. If the springs and cables both failed, the door would have nothing left to support it. You might think that the thicker the cable, the better always. That isn’t true. While thin cables can wear more quickly or break more easily than a thicker cable, you also don’t want a cable that is too thick. A cable that is too thick is harder to open and close, as it doesn’t glide over the pulley and drums as easily as a properly sized cable will. That is why it’s crucial you find a cable that is the best match for the size and weight of your garage door. You need to find a balance between the weight of your door, and the thickness. A garage door professional can help determine this. The general rule is the heavier your door is, the more thickness you need. Thicker cables support more weight, so it makes sense that a one car garage door needs a thinner cable than a two car garage door. Tip: When you are choosing your cable size, remember that the gauge is thickness. So a higher gauge cable means it’s thicker!